One of my two sailing vessels is a Venture Newport 23. For years, I have browsed websites of fellow owners. 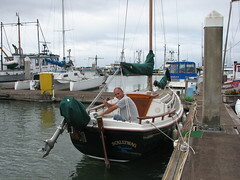 The most impressive makeover that I have seen is a boat in Eureka named 'Skallywag' I have long admired her brightwork and custom rigging. I mentioned to Esther that I would like to stop at the Eureka marina and see if I could find it. I not only found one, but two Newports, one of which was the jackpot. Esther watched as I drooled over them and emptied two rolls of film (just kidding - I love digital photos) I wonder if it will be enough to spur me to restore my Ellen Maria. After spending the morning on the dreary coast, we made our way in the afternoon to the sun and warmth of the Mendocino valley, settling on a Motel in Ukiah. Yeah, after two nights in a rest area, we figured we deserved it. We enjoyed an evening walk through Ukiah, even catching some local flavor at local music festival. I was just telling Bjorn, when I think of a nice vacation (esp. after being as busy as you two have been) the last thing I would want to do is drive anywhere! I'd want a spot to sit and relax. And he said that is the way you both relax, going on a roadtrip. It's funny the differences! I wonder if Bjorn will be more like his parents or more like me?